Place sliced strawberries in a bowl and mix 1/4 cup of sugar with them. Set aside. Sift powdered sugar and flour together. In a large bowl beat the egg whites, cream of tartar, and vanilla with an electric mixer on medium speed until soft and fluffy. Gradually add the regular sugar while still beating. When through, the mixture should be a bit stiff. Fold the sugar and flour mixture slowly a little at a time into the bowl. Pour into an ungreased 10 inch tube pan and bake on the lowest rack for 40 minutes. Immediately turn cake upside down on a serving plate and allow to cool. Mix whip cream in with the strawberries. The whip cream may turn pink. With a straw, poke hole all over the cake. Mix jello packet with one cup of hot water. Pour jello all over the angel food cake creating swirls of color. 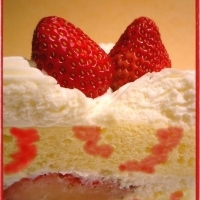 Frost the cake with the whip cream and strawberry mixture. Slice the whole strawberries in half and use to garnish the top of the cake. I can't wait to try this. I love strawberry anything! Oh, this is great and picture is beautiful. Thanks for share it. Like carebecca's recipes? Never miss an upload!